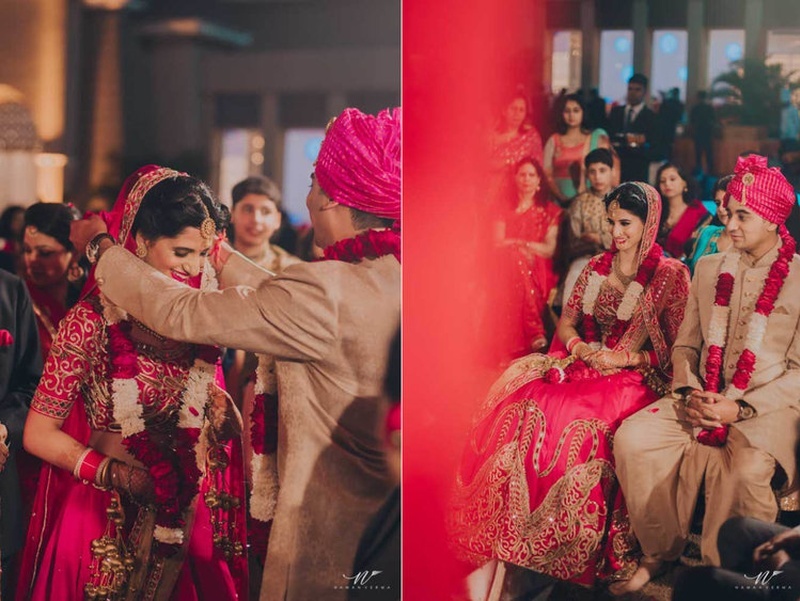 Ceremony and celebration as vibrant and full of love as the couple themselves. 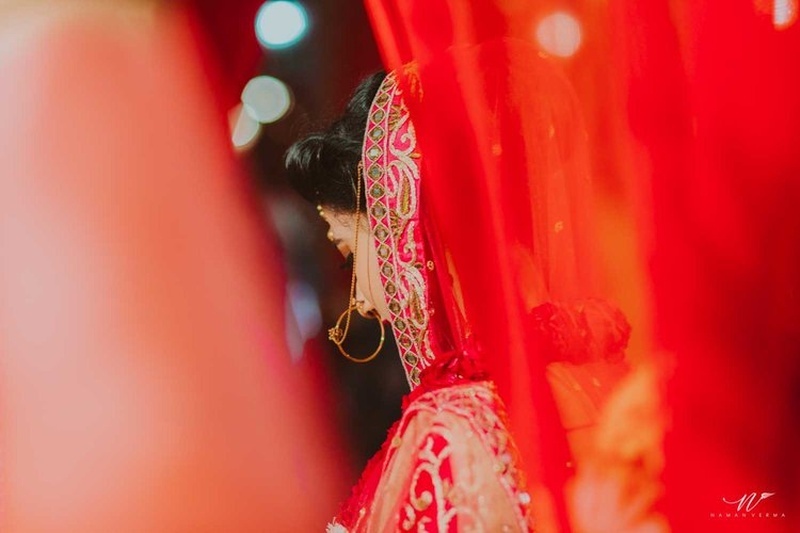 Adept at clicking images that almost come alive and start talking to you, Naman Verma's wedding photography at Sourabh and Parul's phenomenally beautiful wedding, where people, emotions and colors take center stage, creates a visual story that mesmerizes, so much so that we can't stop looking at these pictures. 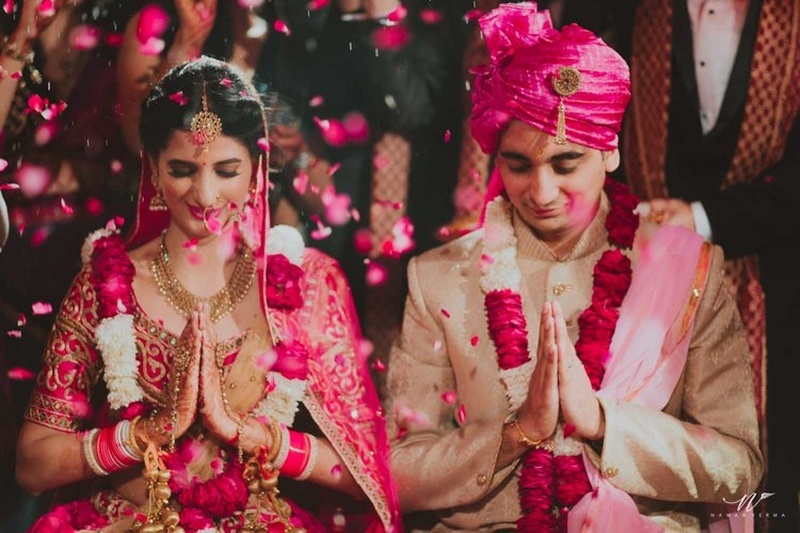 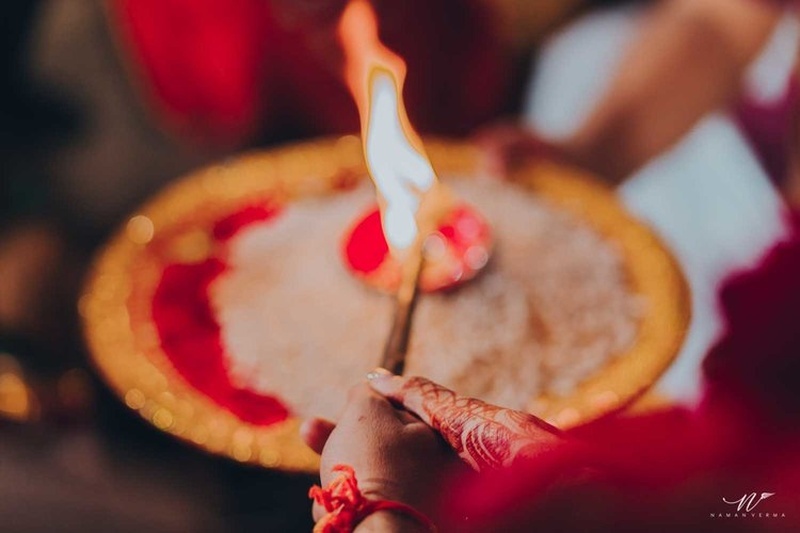 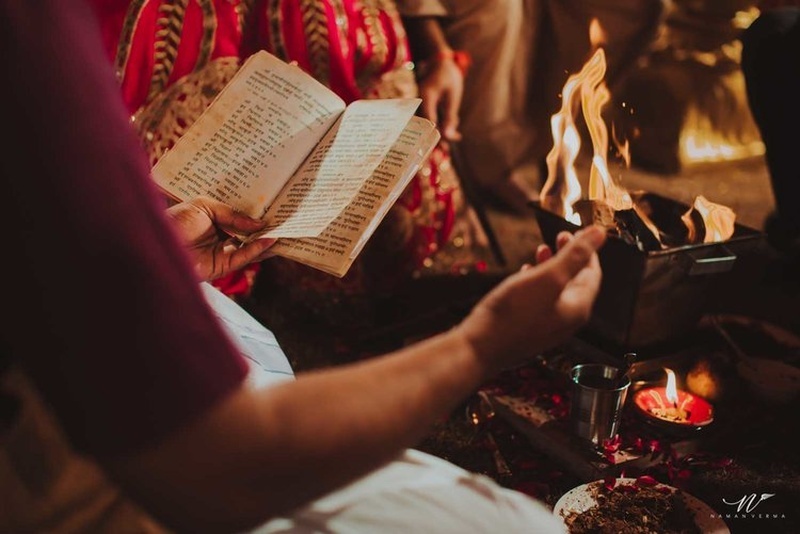 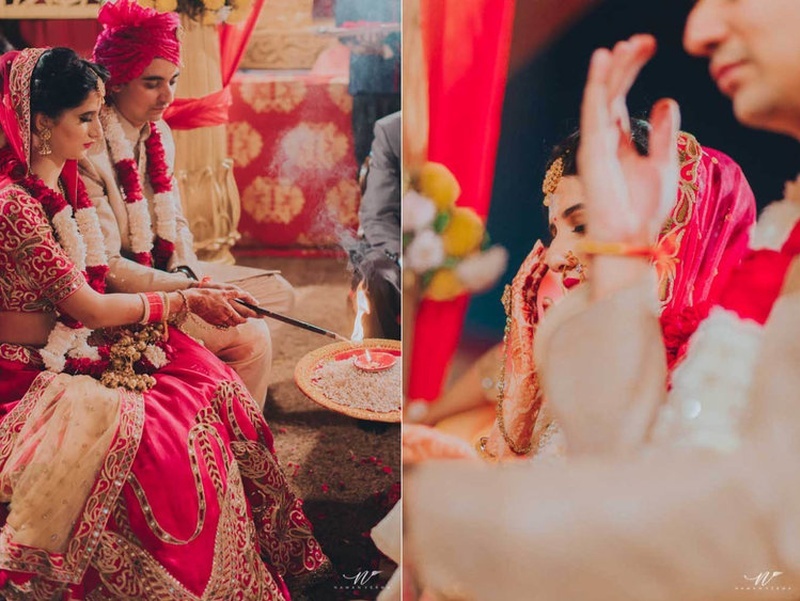 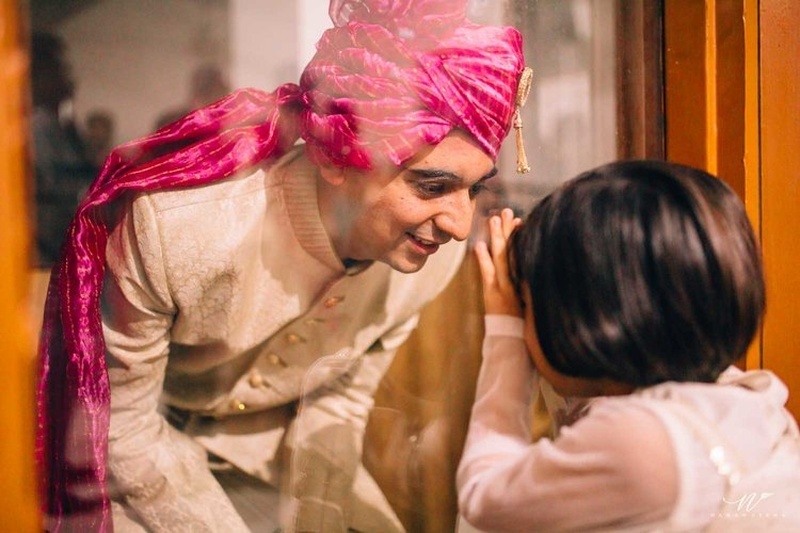 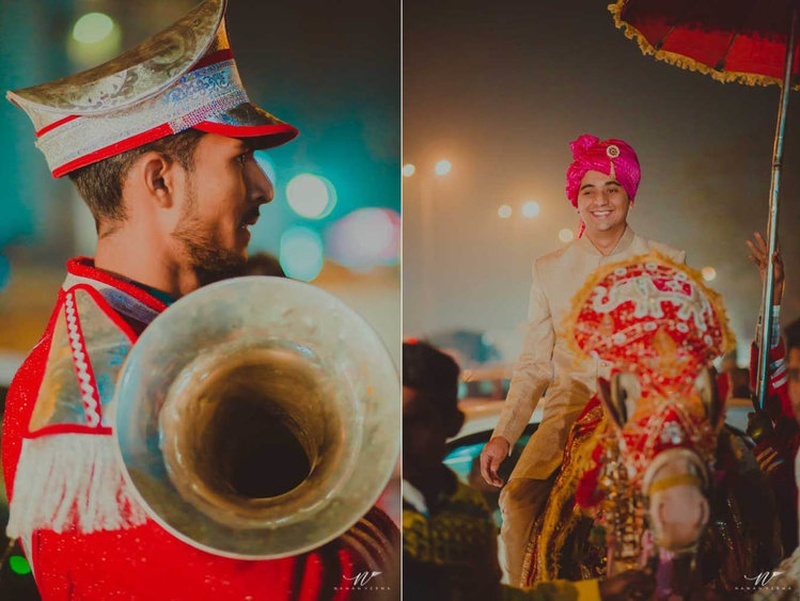 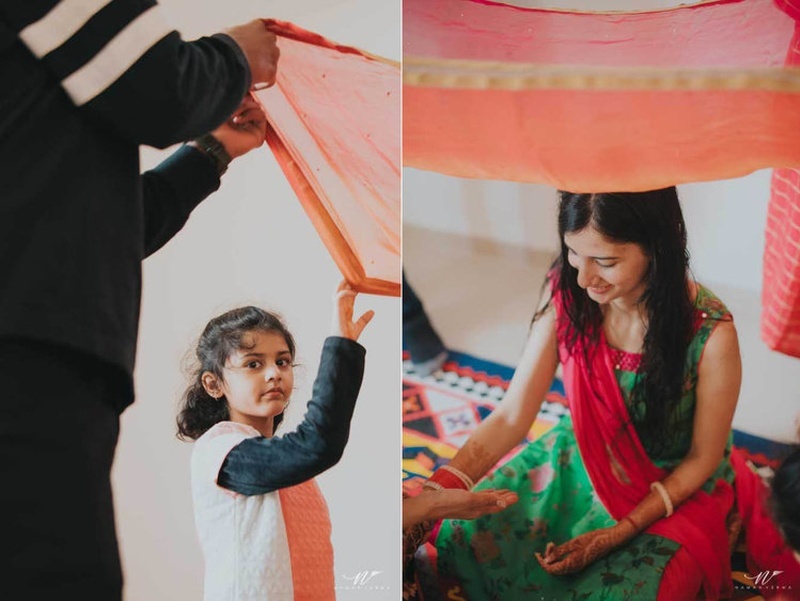 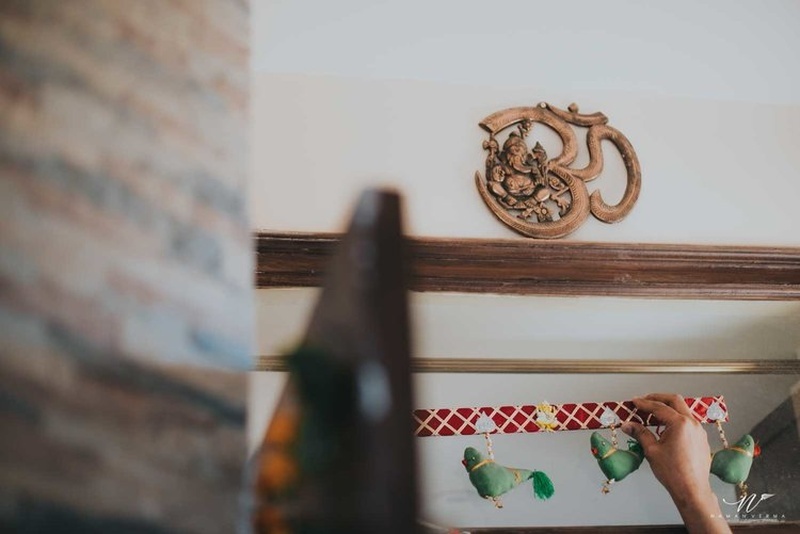 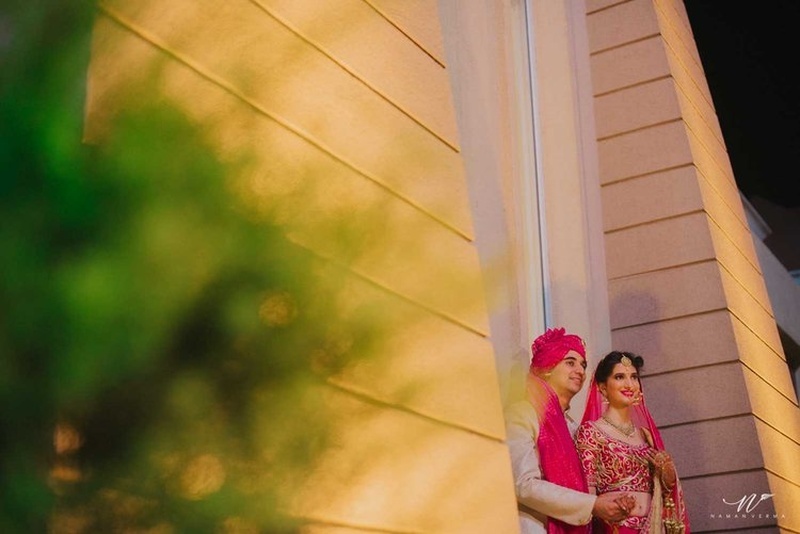 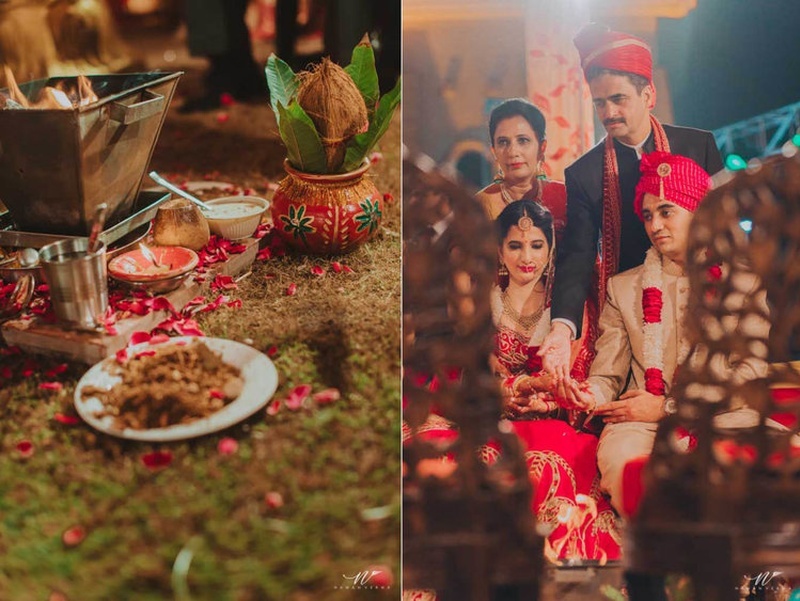 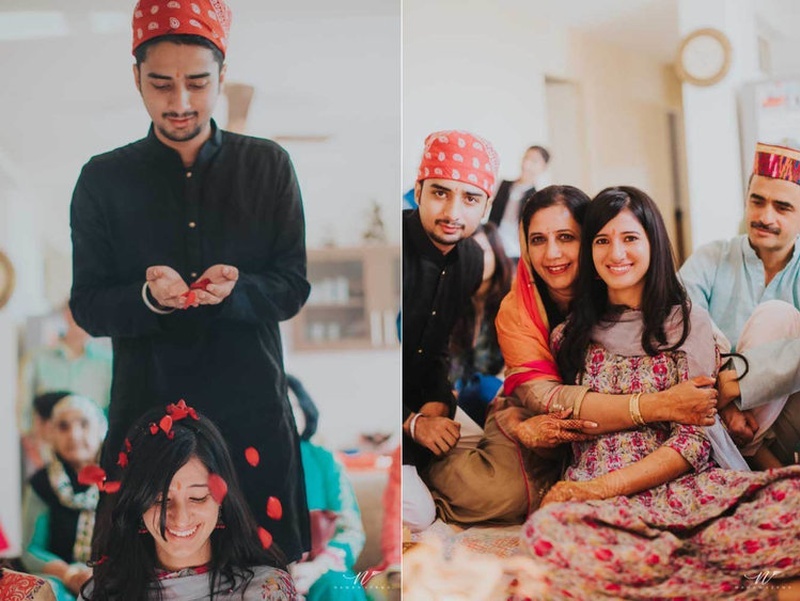 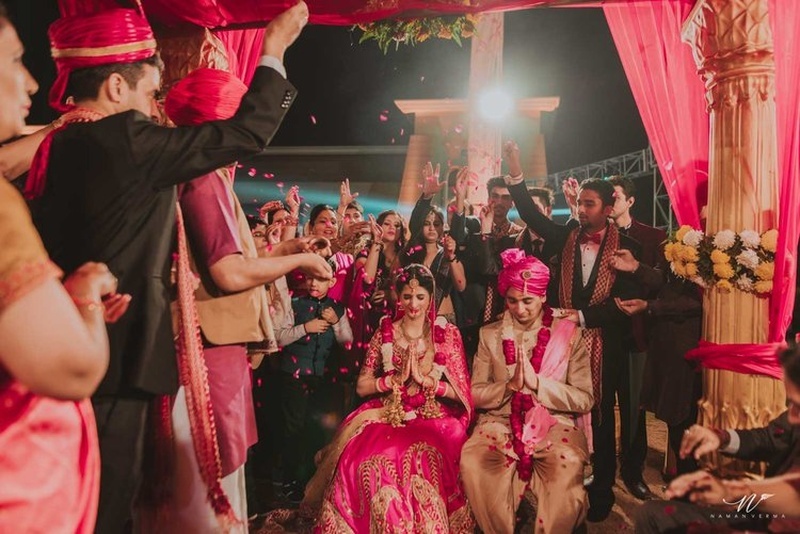 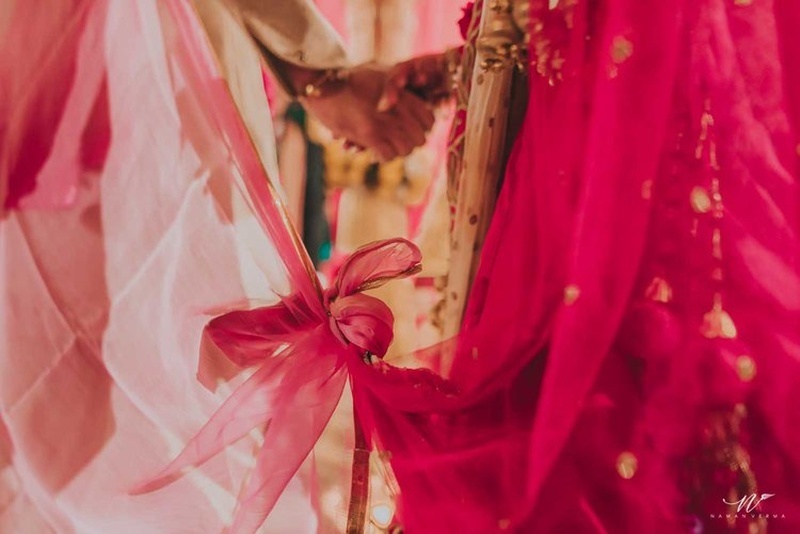 Sourabh and Parul's eight year old relationship culminated into a ceremony and celebration as vibrant and full of love as the couple themselves. 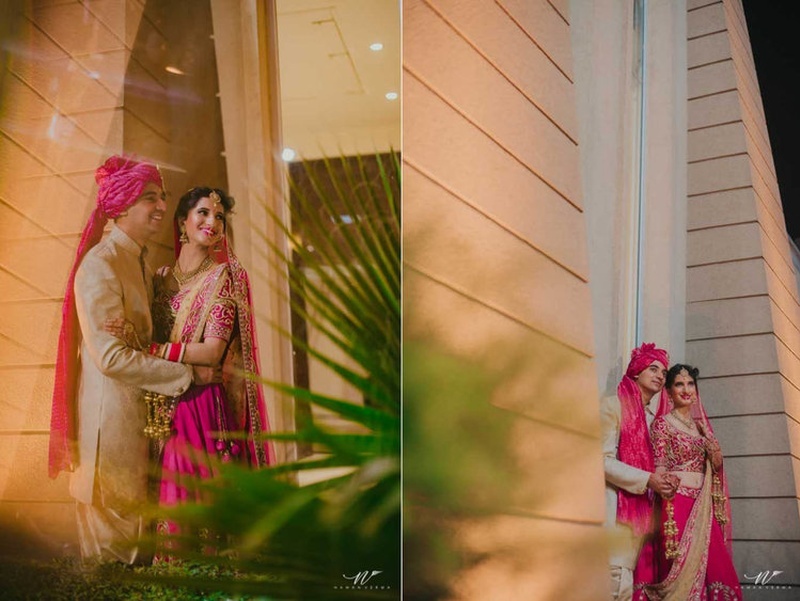 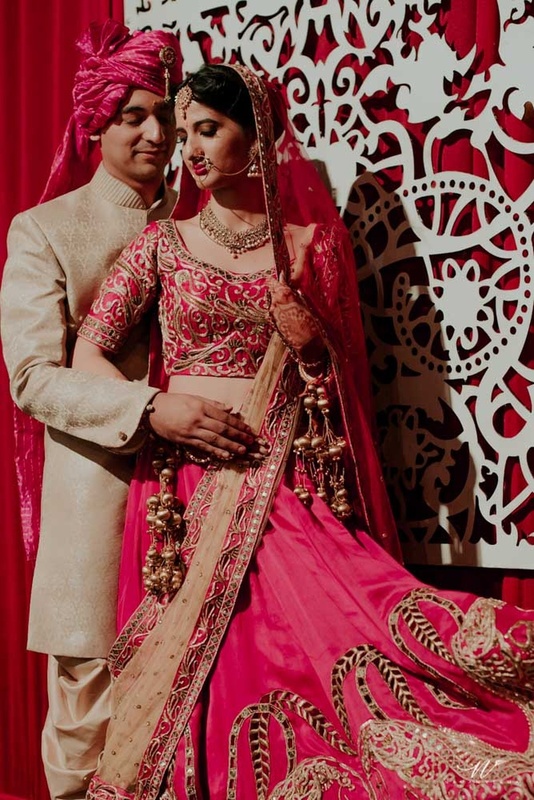 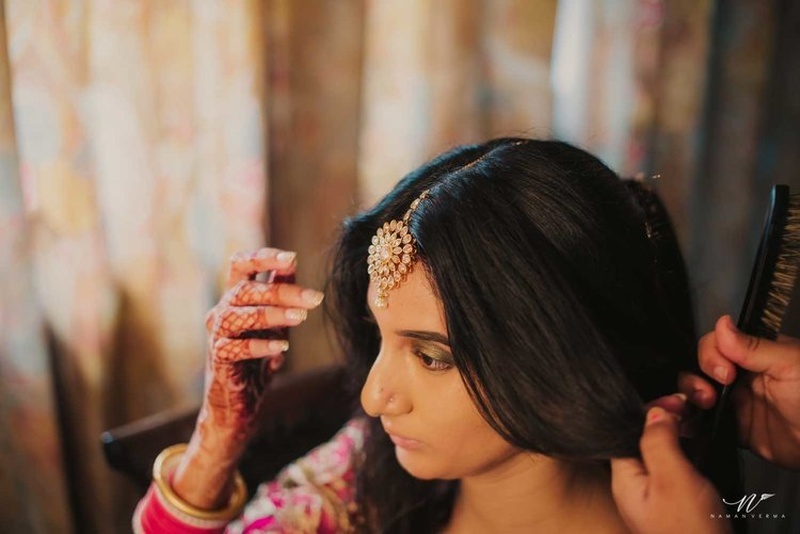 The glorious bride Parul resplendant in a vintagy rani pink wedding lehenga with bold aari-taari accessorised with heirloom jewellery drew a simple yet stunning bridal portrait. 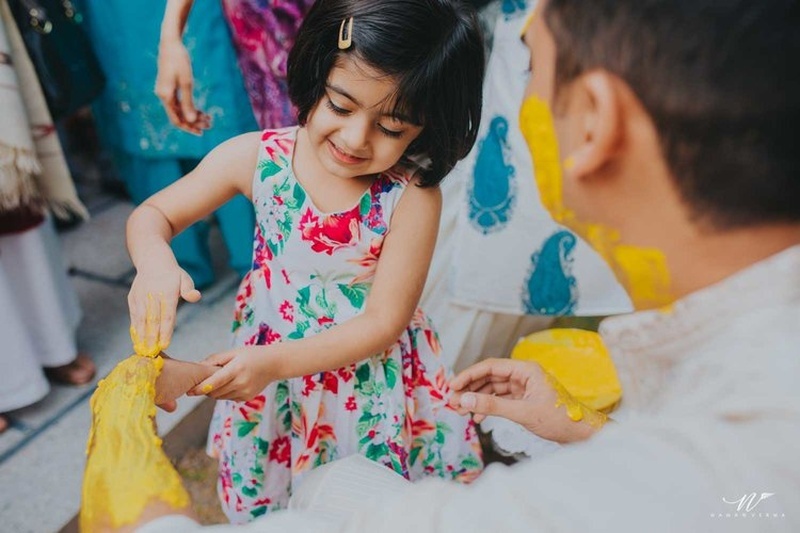 Heartwarming family moments during Haldi, ceremonial poojas baraat and Pheras are not to be missed. 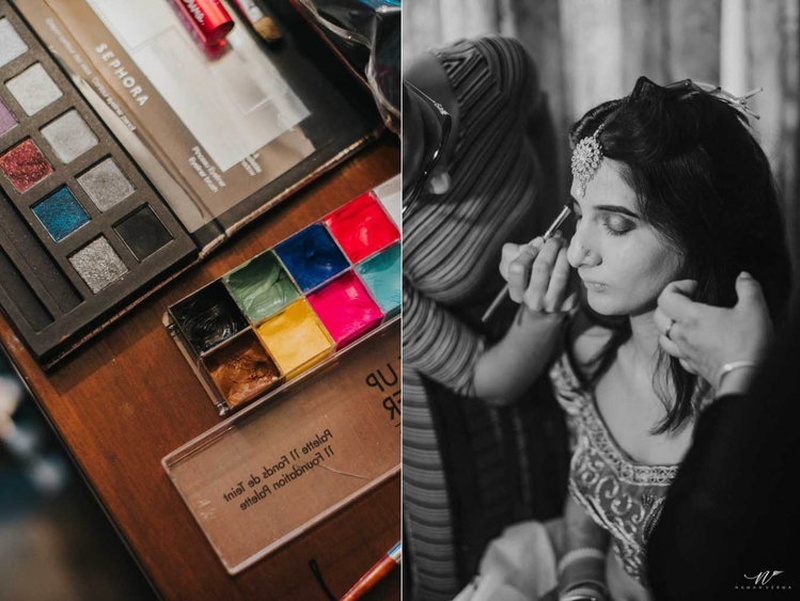 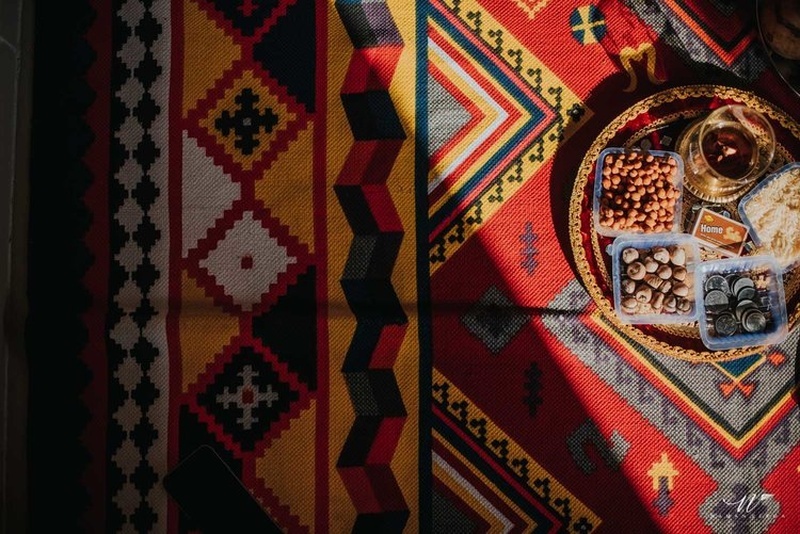 Scroll on to see images from this wedding album that almost comes alive as the pages turn. 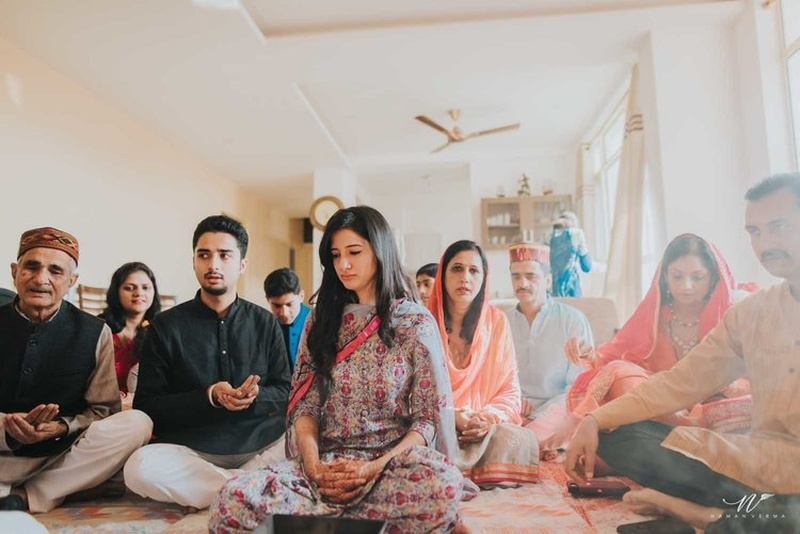 Pre wedding pooja at bride's house. 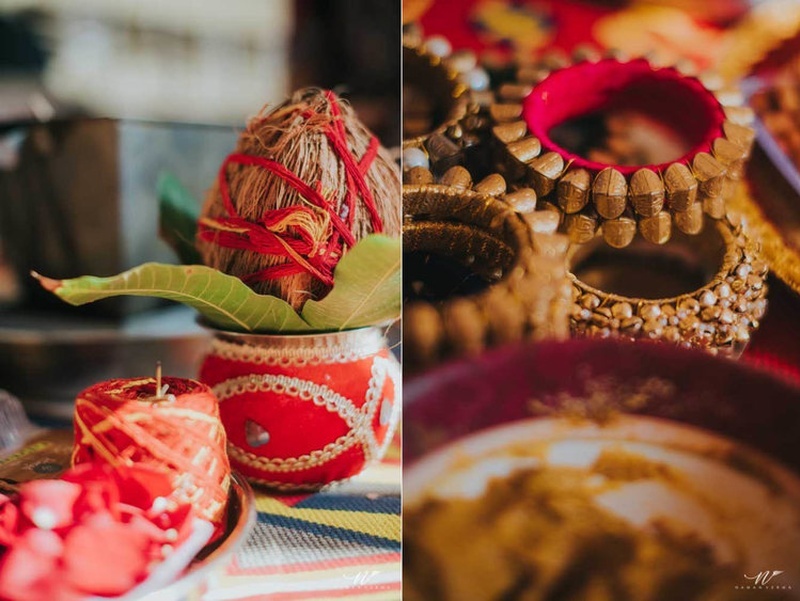 Pojja thali decorated with lots of pooja things. 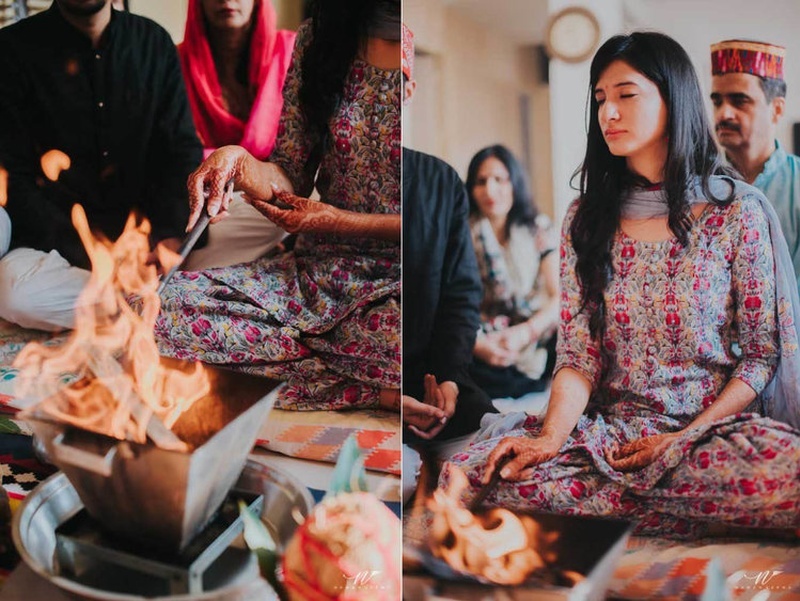 Pooja before the haldi ceremony. 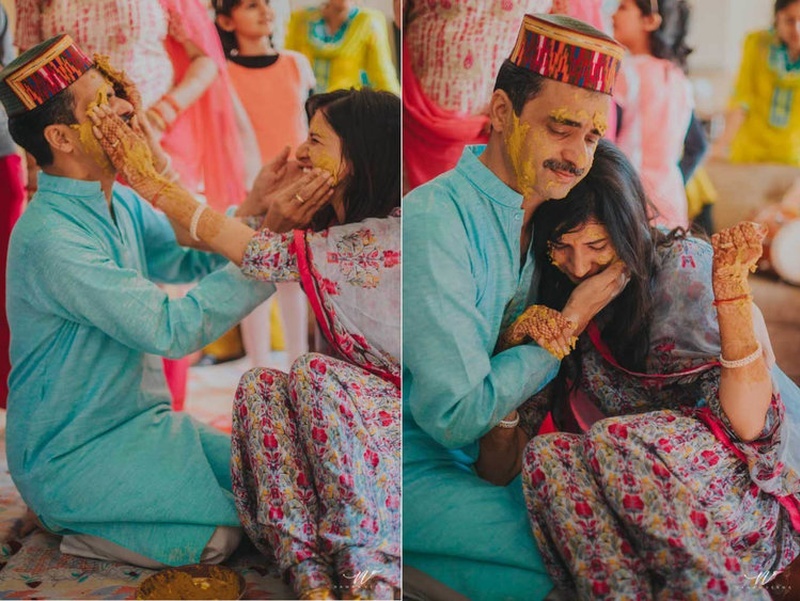 Bride's brother showering flowers on her sister before haldi ceremony. 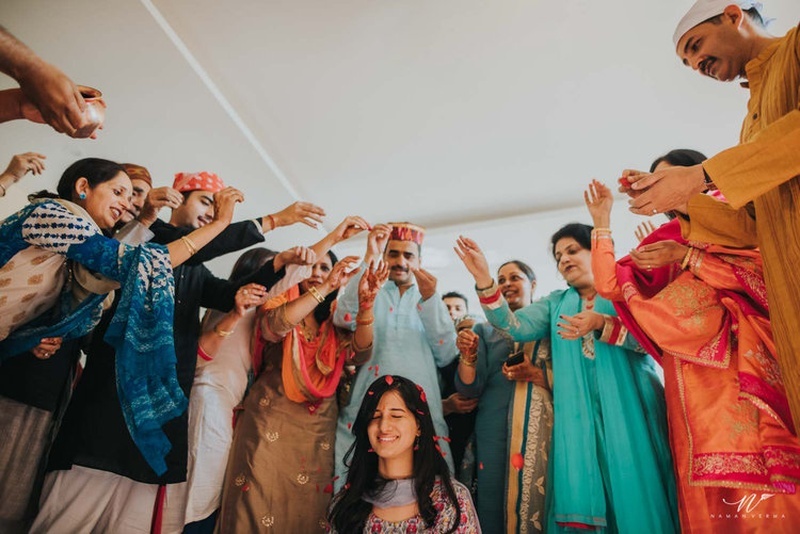 Flower Shower for the bride. 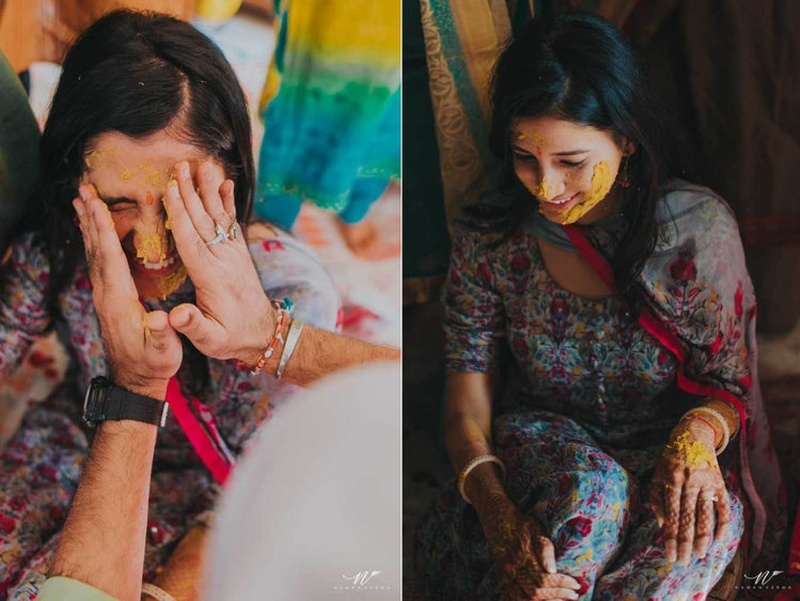 Parul drenched in haldi for the haldi ceremony. 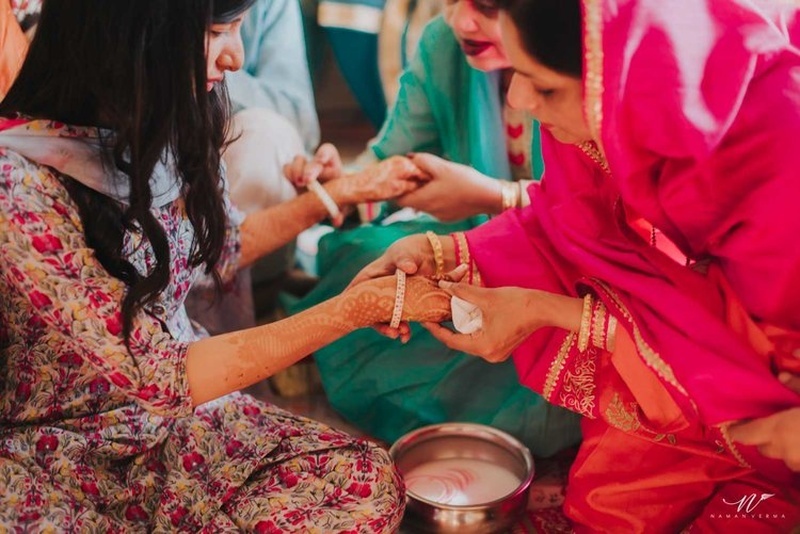 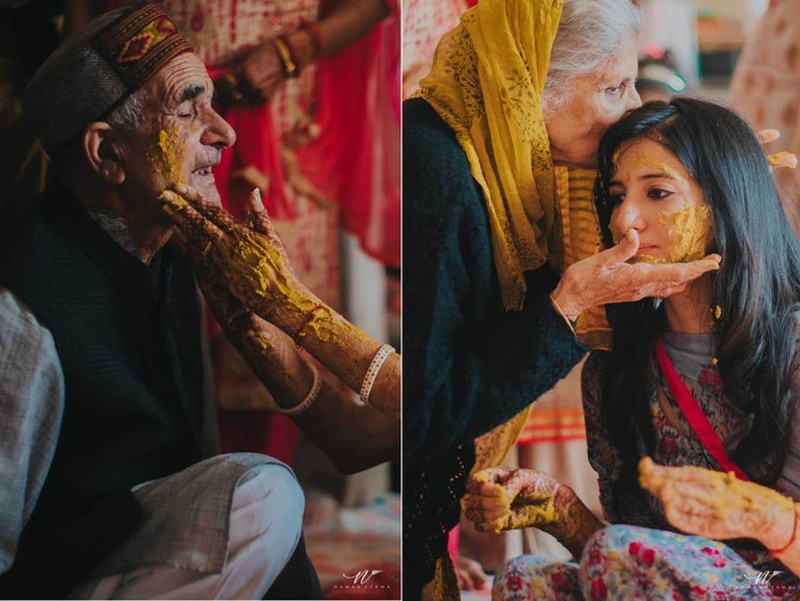 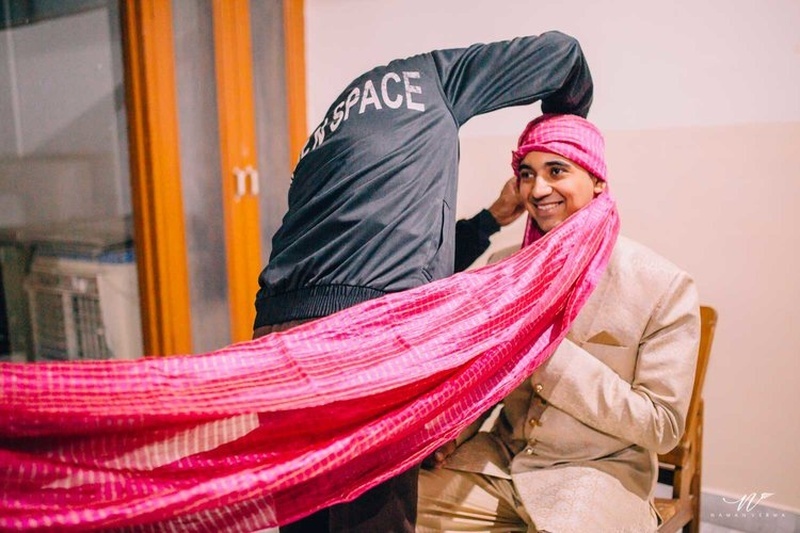 Fun and emotional moment at haldi cermeony captured brilliantly by Naman Verma Photography. 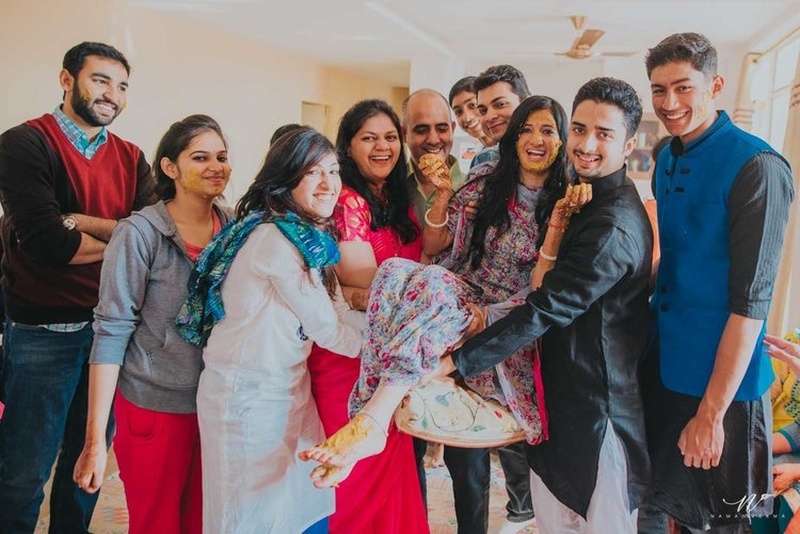 Bride picked up by all her cousins after the haldi ceremony. 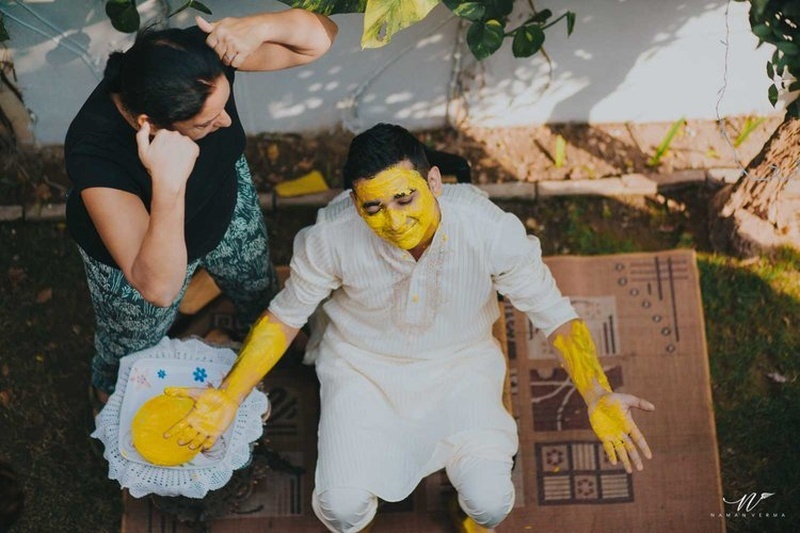 Saurabh drenched in haldi paste for the haldi ceremony held at his house. 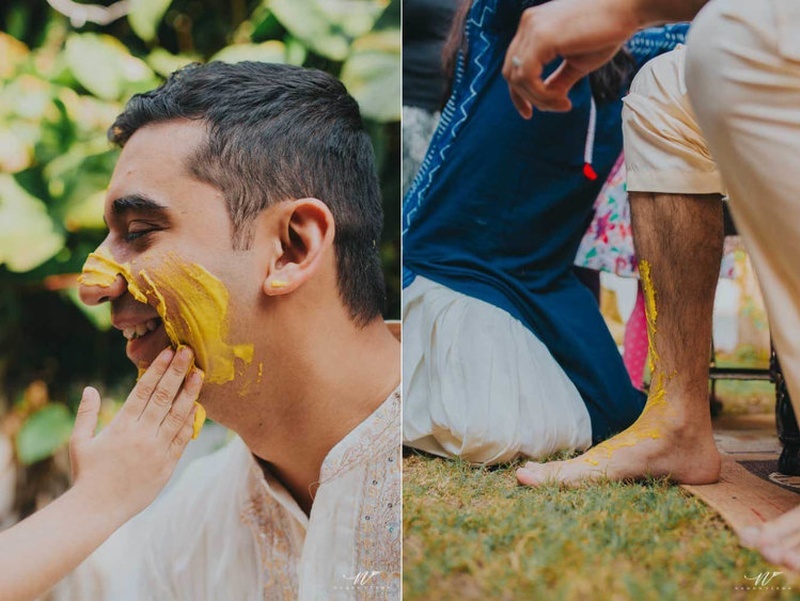 Cute little kid putting haldi to the groom. 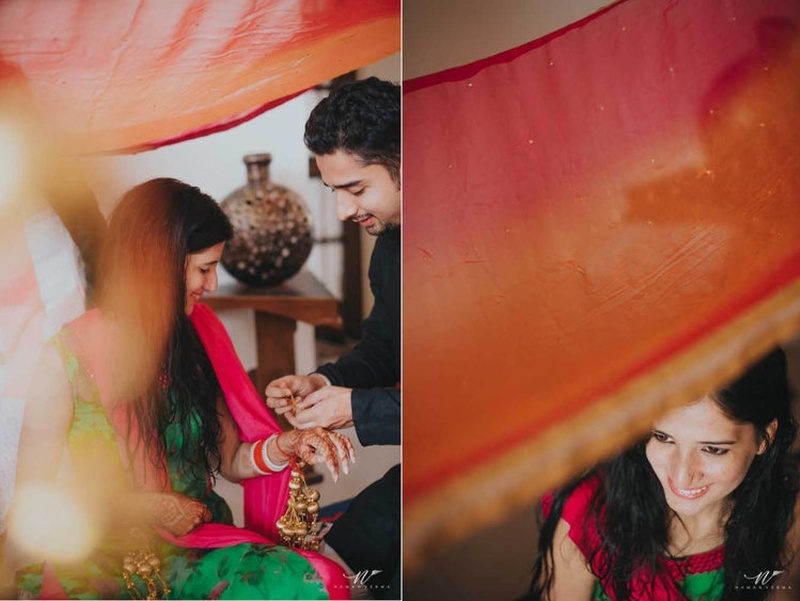 Parul dressed in pink and green salwar kurta for the kaleere ceremony . 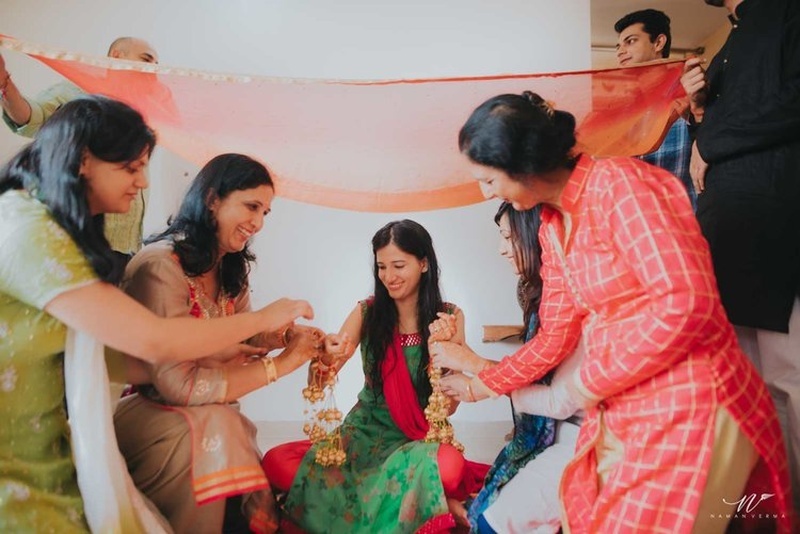 Bride with her bridesmaids and family at her kaleere ceremony. 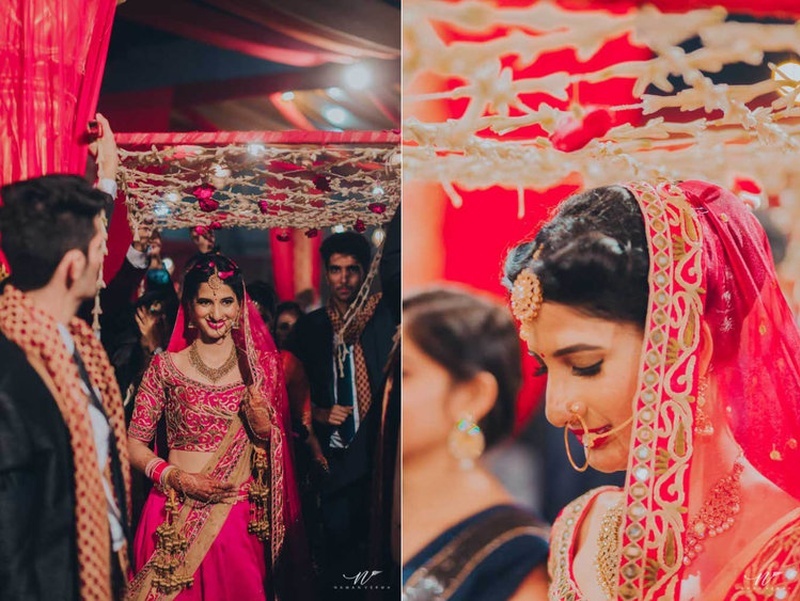 Dark pink bridal lehenga with gold zardozi work by Shruti S and kundan bridal jewellery for the wedding ceremony. 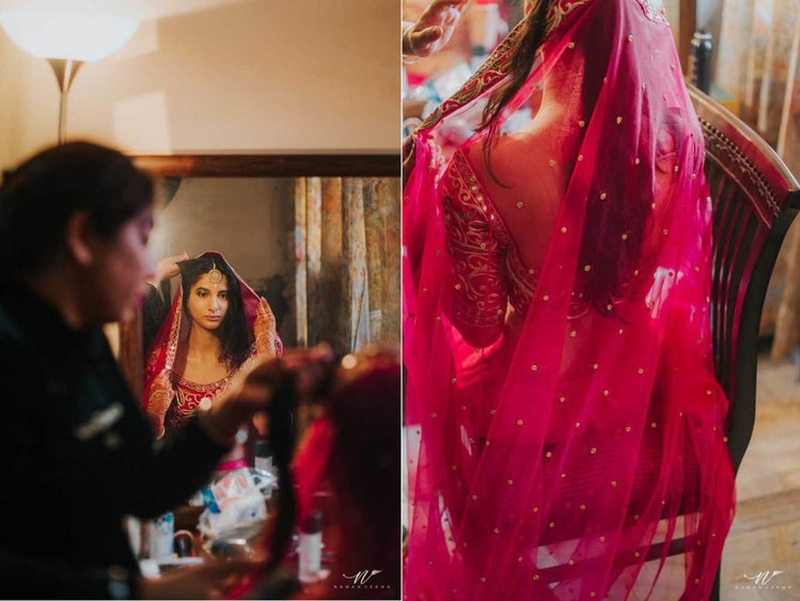 Bride getting ready for the big day. 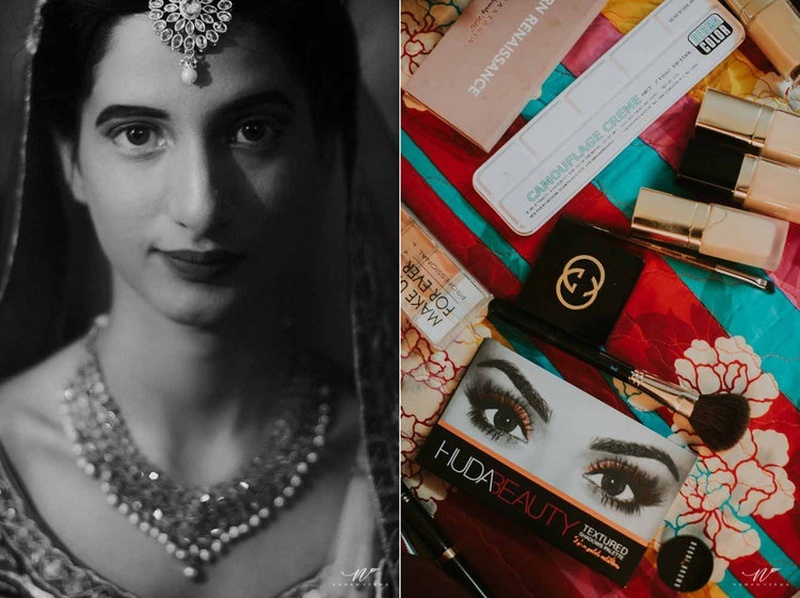 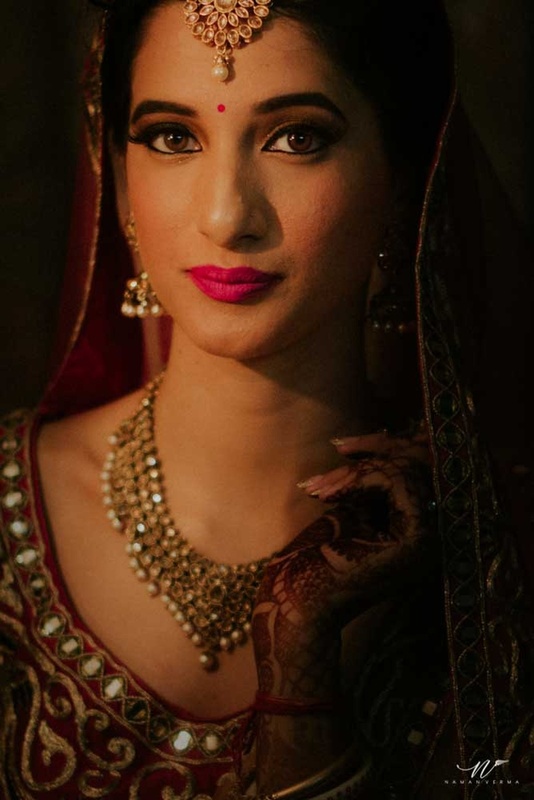 Bridal makeup by Surkhab Anjum. 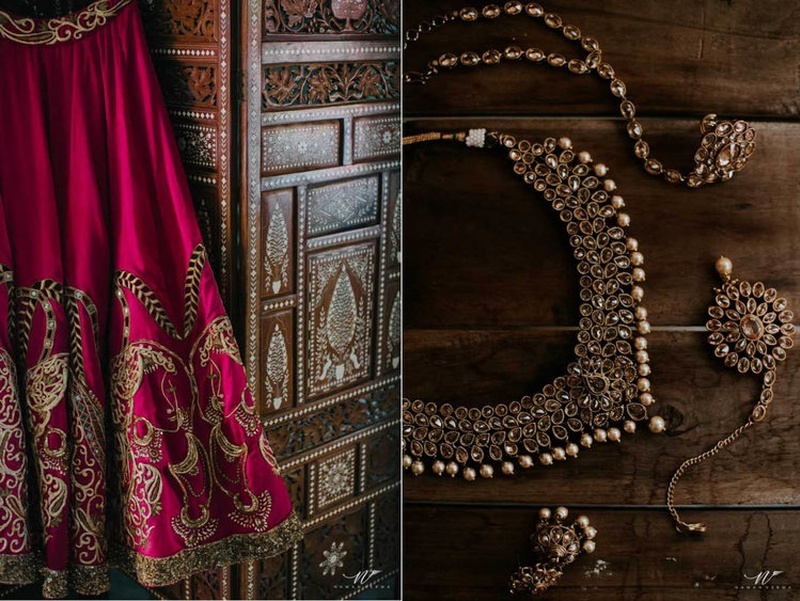 Beautiful kundan and pearl maang tikka stealing the show! 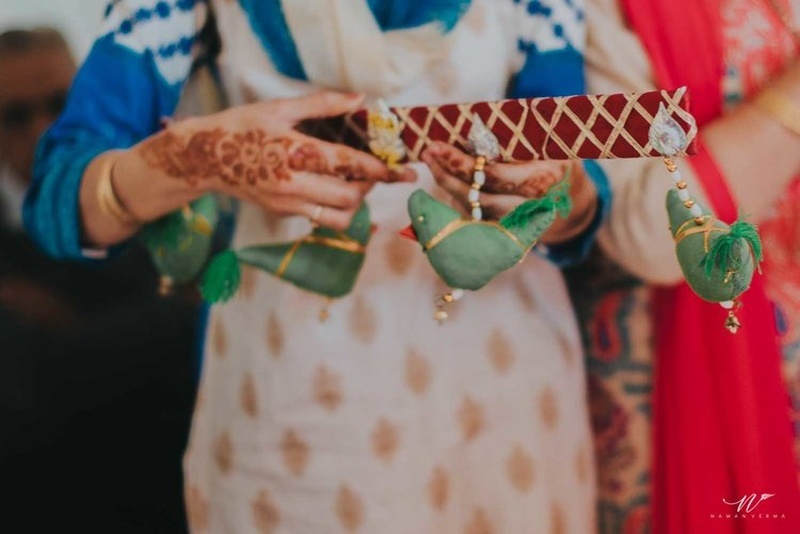 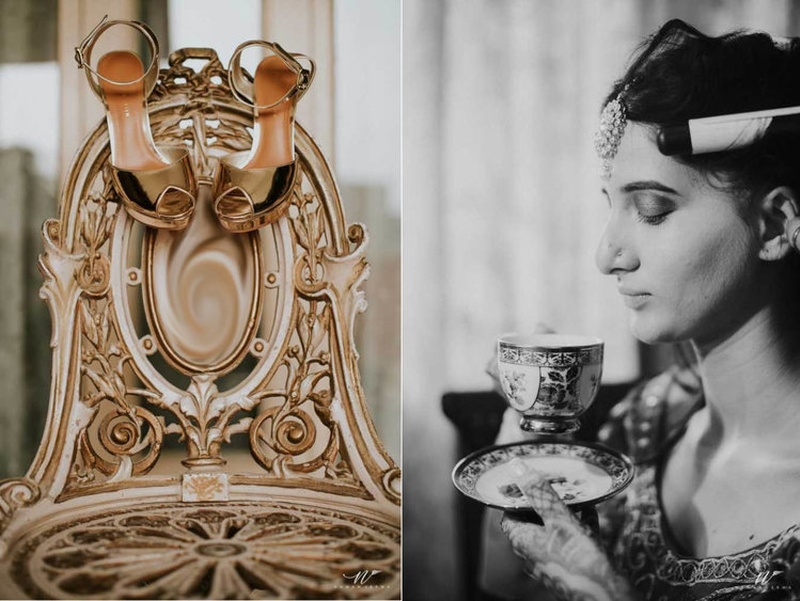 Wedding shoes photography done right by Naman Verma Photography. 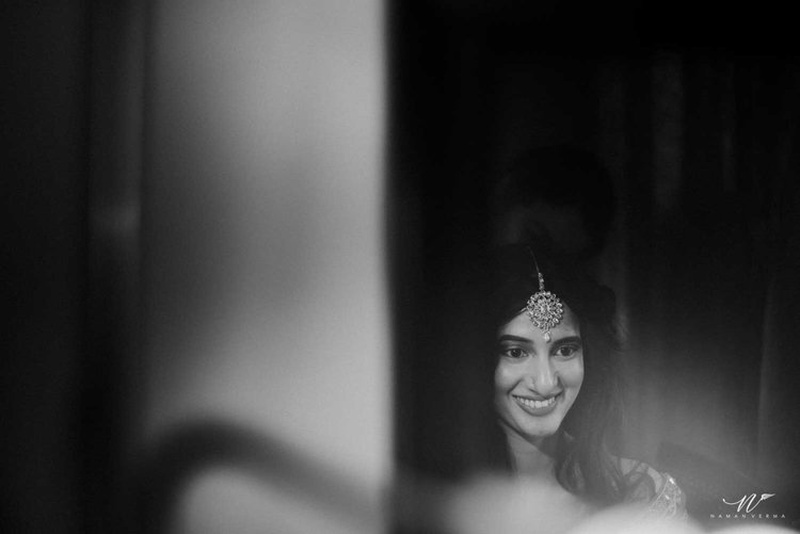 Black and white bridal portrait by Naman Verma. 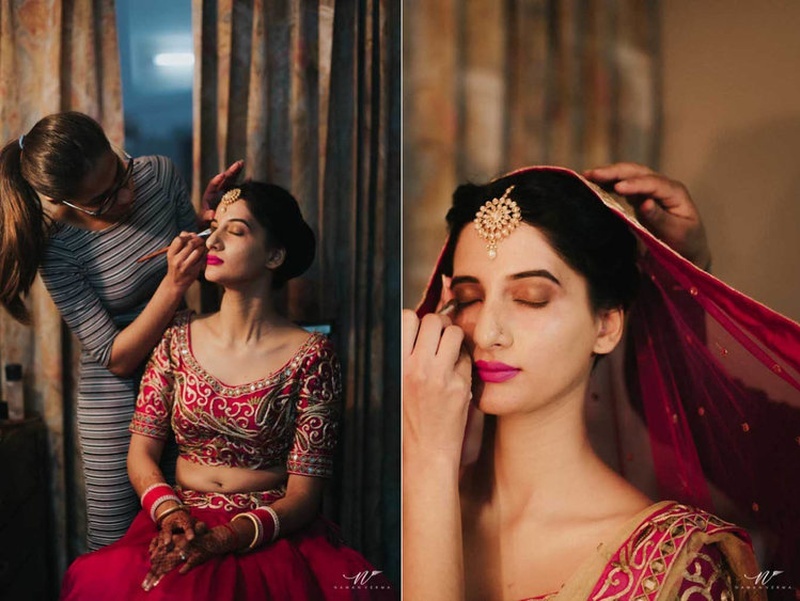 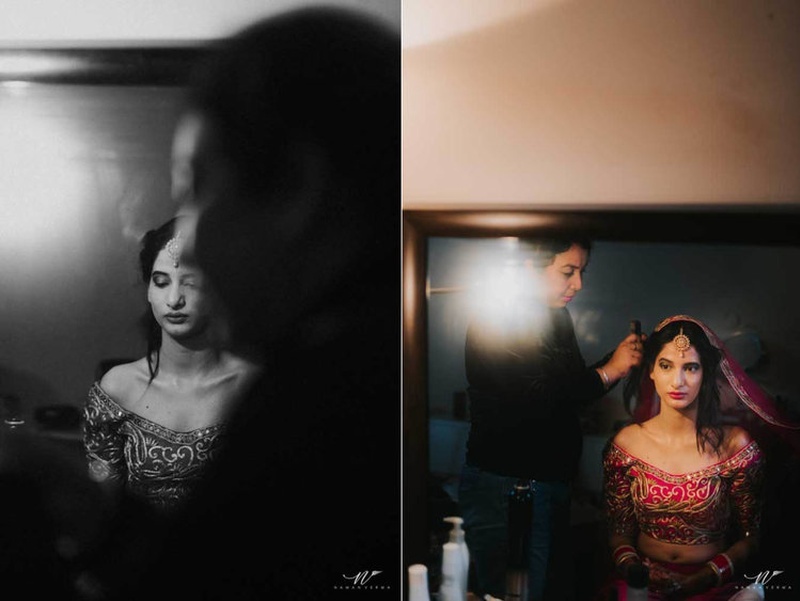 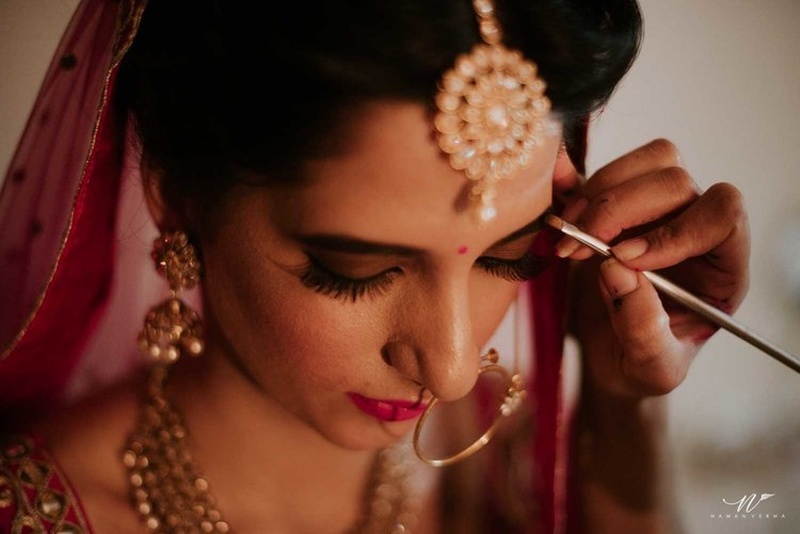 Bridal shot captured brilliantly by Naman Verma Photography. 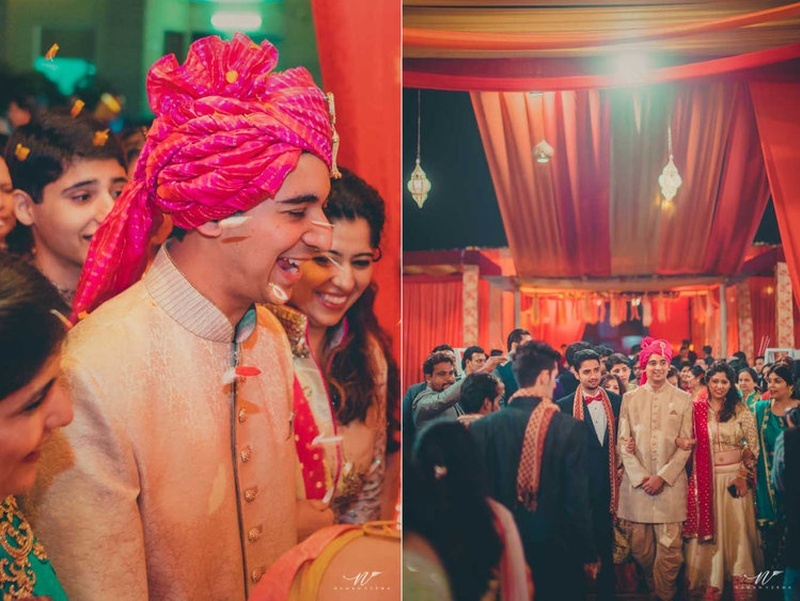 Complementing Parul, Saurabh dressed up in beige and gold sherwani styled with pink saafa. 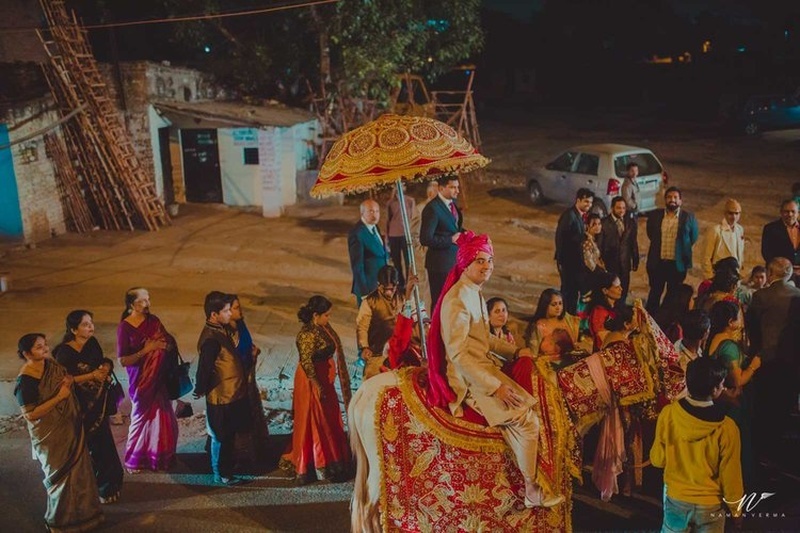 Baraat arriving at the wedding venue. 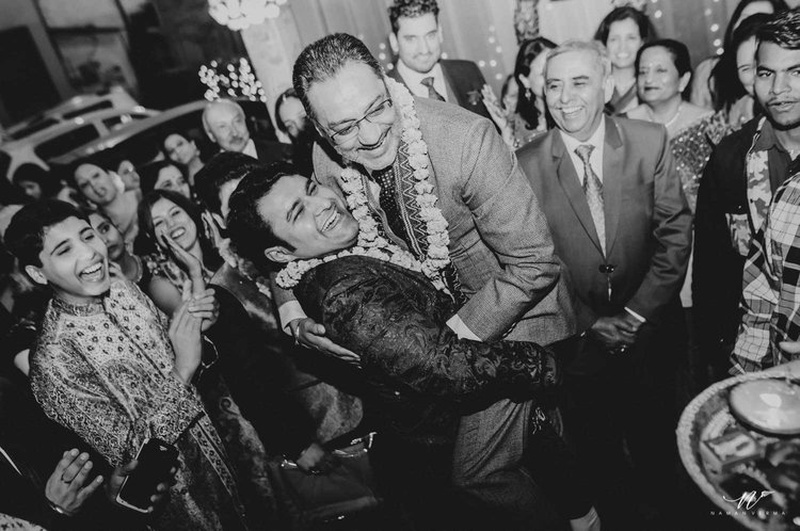 Baraatis having some extra fun ! 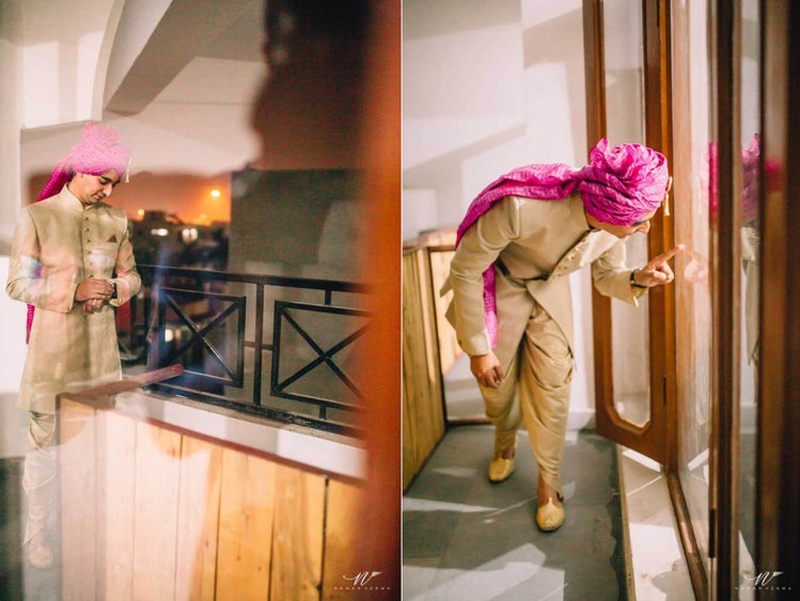 Saurabh entering the wedding venue with all his baraatis. 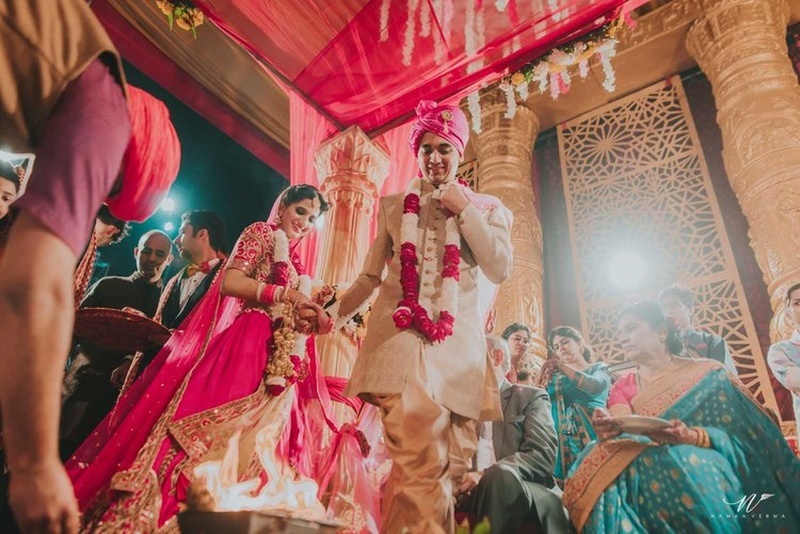 Parul's brothers walking her down to the ceremony with phoolon ki chaadar. 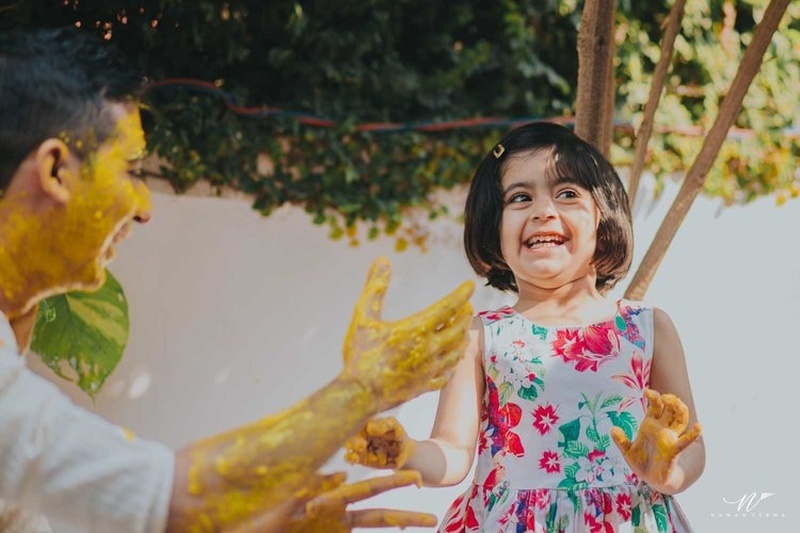 Just smiling her way through. 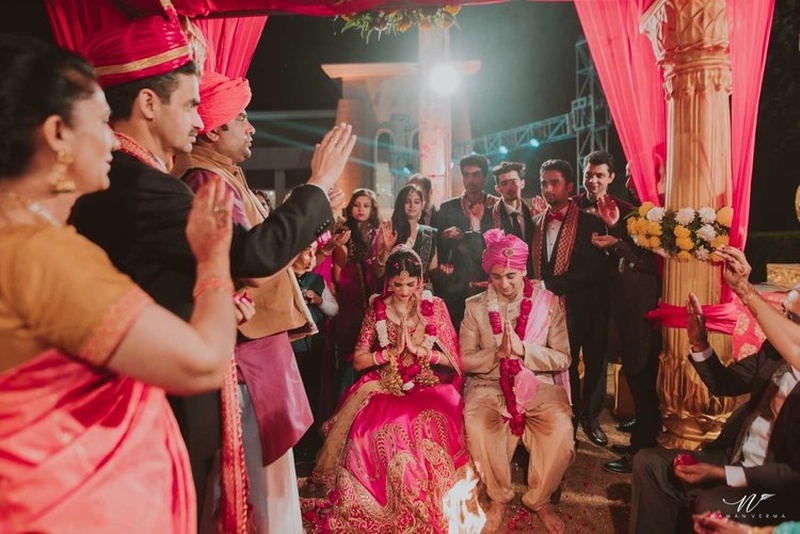 Varmala ceremony held at Aura gardens, Zirakpur. 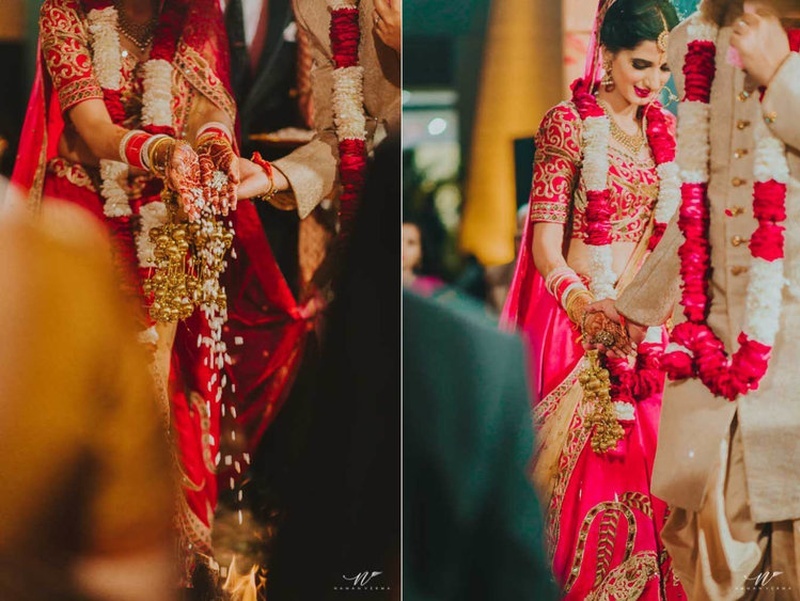 Flower Shower on the couple after they getting hitched. 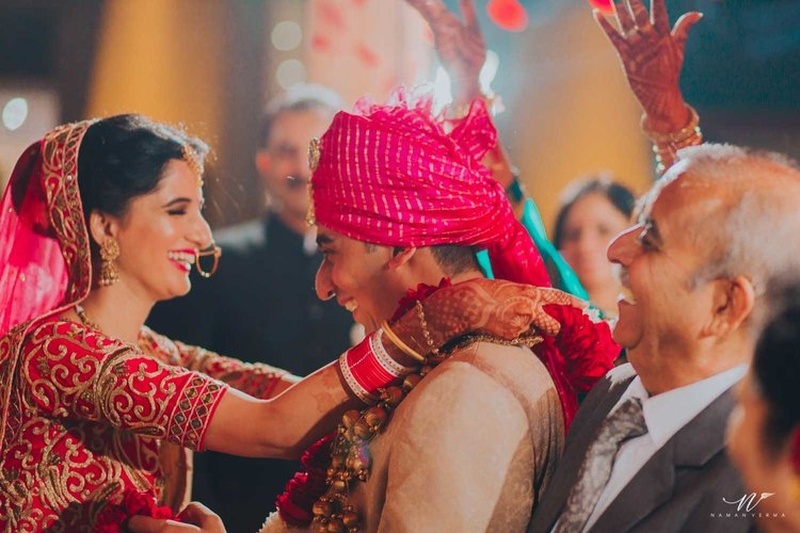 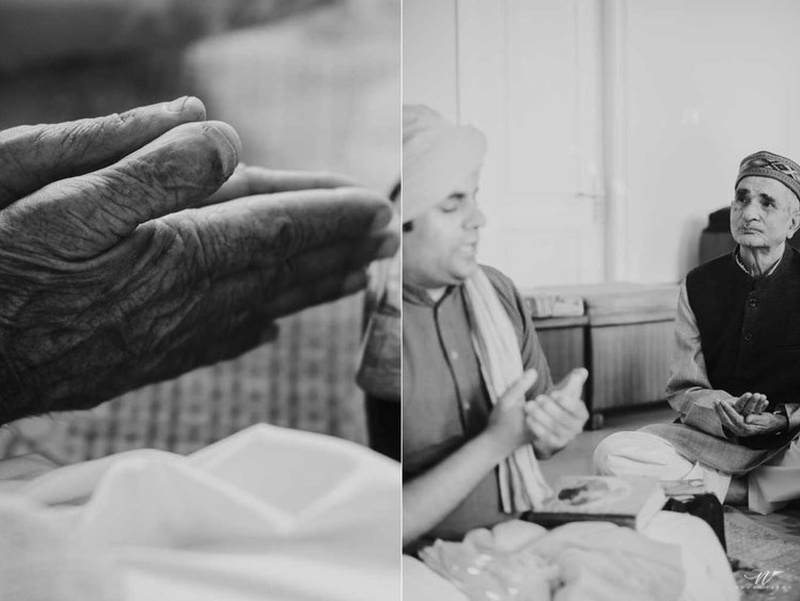 Vidaai moment captured beautifully by Naman Verma. 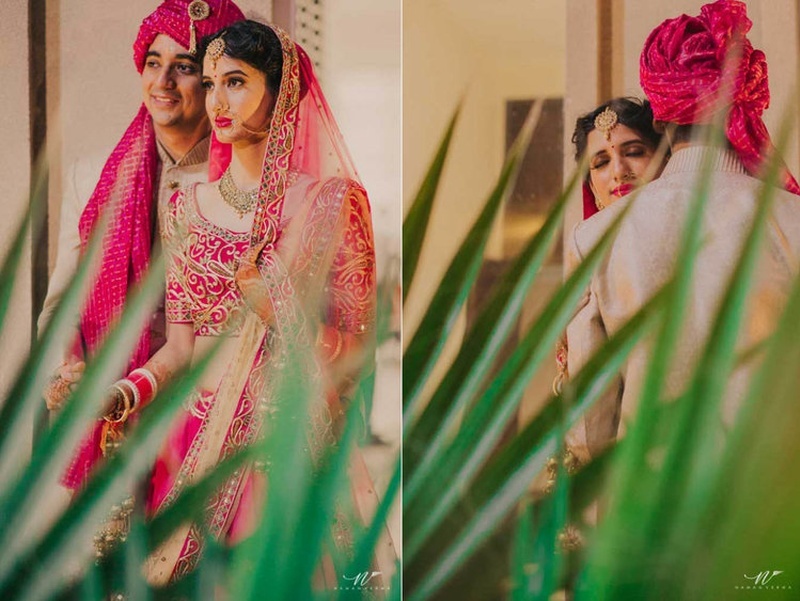 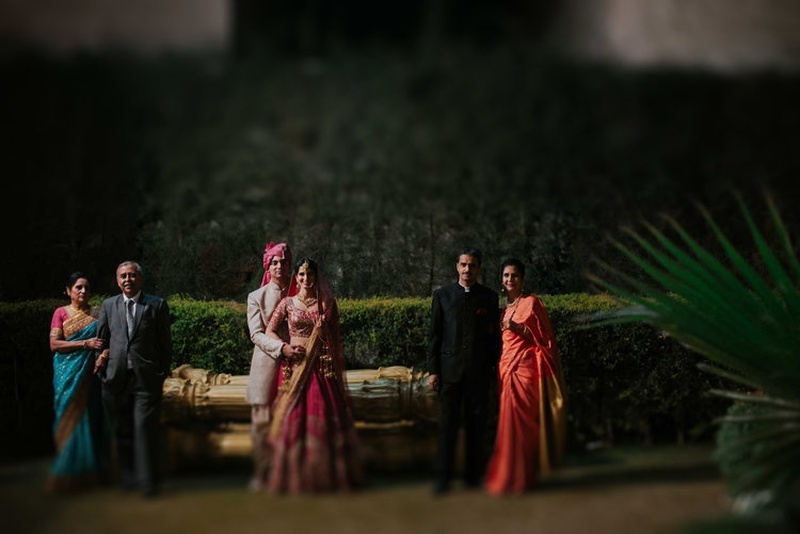 Couple photoshoot post wedding done brilliantly by Naman Verma ! 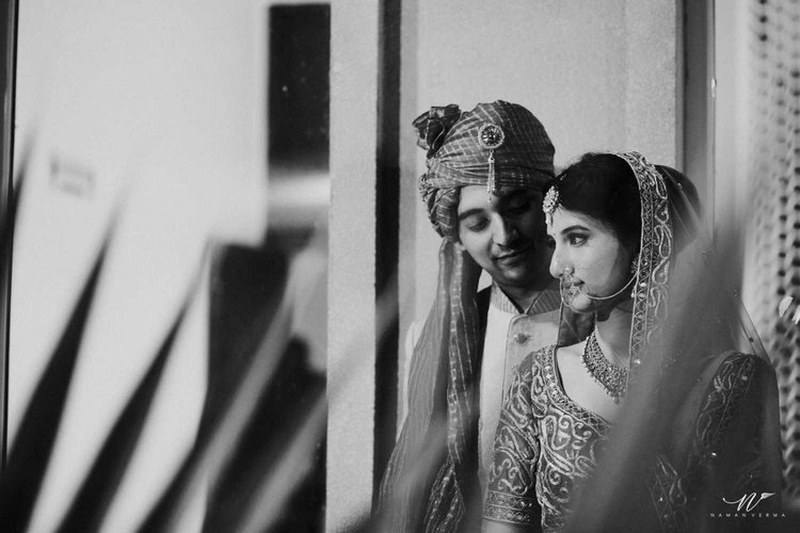 Post wedding black and white couple photo by Naman verma. 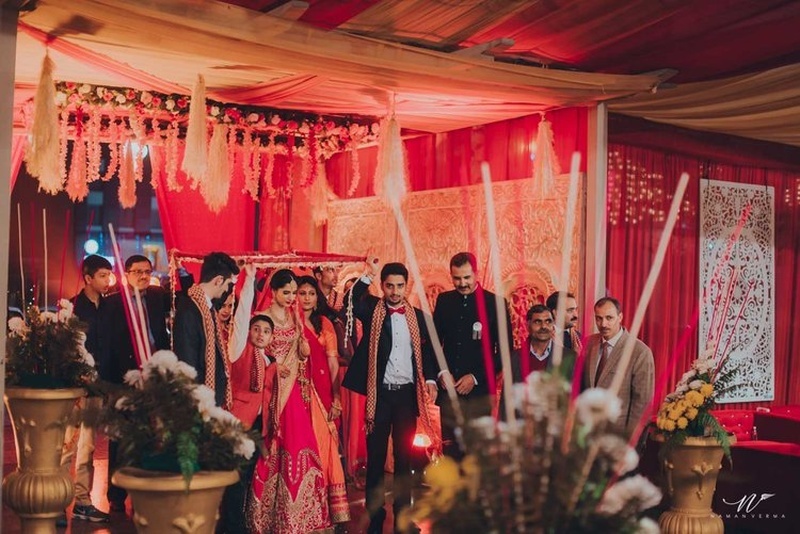 Dressed up in color coordinated outfits for the wedding ceremony held at Aura Gardens, Zirakpur.